Quick and easy Banana Split to cool you off all summer long. Share, don't share, this Banana Split for One is your own indulgent treat! Scoop out half the ice cream from each of the containers. 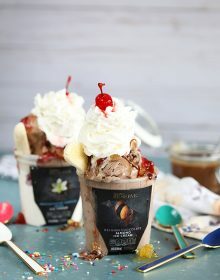 Add the chocolate ice cream to the vanilla ice cream container and then add the scooped vanilla ice cream to the chocolate ice cream container. Garnish each sundae with half the pineapple, strawberry sauce, hot fudge sauce, and butterscotch sauce. Top each sundae with whipped cream and a cherry. Decorate with sprinkles, if desired. If only making one sundae, replace the lid on one of the pints and store in the freezer until ready to use.